A great everyday commuter saddle, I’ll give you a run down of the details. It is in the Performance Short category of saddles which means the back of the saddle is shorter. At 250mm in length and 130mm wide in the rear, compared to the Performance Long (PL) line that is 275mm long. The PS 1.1 is an excellent option for triathletes who ride in the aero bars and perfect for flat courses where the athlete stays in one position. With its upward- sloped rear, it was designed for those athletes who do not move around a lot. The PS 1.1 is my preferred level of padding at a cushion of 30, ideal for those who ride in triathlon chamois shorts or regular cycling shorts. With its superb hip support for those who rotate forward, it provides a soft and comfortable ride. The PL 1.0 or Breakaway is also a 30 cushion level-wise if you are looking for a similar riding experience. As with every saddle from ISM, the Performance Short line focuses on the padding area of your sit bones. The famous nose-less designs removes pressure on the pelvis area that creates numbness, which means, you can complete that long 50-mile bike ride! What I always dealt with in the past before ISM was an uncomfortable ride. These saddles are healthier for you as a man or a woman and will provide you with a more enjoyable experience. The bonus of the 1.1, is that it is less expensive that the other models due in part to its lower budget by still high-quality chromaly rails. 1. A change from the Performance Long category I have used since day one. 1. This saddle is perfect for every day. Even though in the description it is said to be meant for triathletes and cyclists who do not move around during races, I think it is ideal for other kinds of rides as well. The level of cushioning is right up my alley, is lightweight, and perfect for smaller folks like myself. 3. I am a fidgety rider, that is for sure. But when I use this saddle for biking around town, it still provides a soft and comfortable ride thanks in part to its hip support. 4. I said this in my last review, but I mean it! The sleek appearance and bold graphics makes this one very chic saddle on my old road bike. 5. It is made with Chromoly rails. Even though it is a bit heavier, I can’t feel the extra added weight on my road bike. Bonus- it is a less expensive option for those looking to try out ISM. This is a great saddle! It has the best balance of cushioning, cost and quality out of any of the saddles in the Performance Short line. 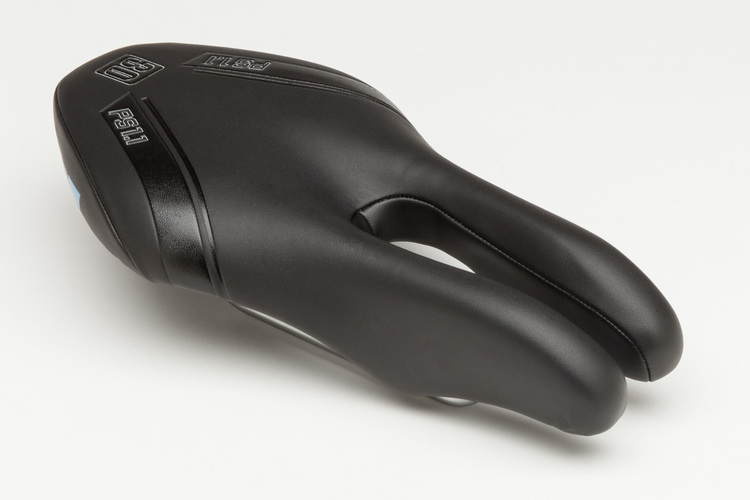 If I use it for commuting on my road bike and it is meant for triathletes and time trialists, then you know it is an all-around perfect saddle, meant for many different types of riders. So far, everyone, I talk to about ISM, can’t stop raving about it. The comfort, quality, and options make this brand, the best in the industry by far. As always, remember that there is a conditioning period with ISM seats. This is because the saddles remove pressure from soft tissue, but that pressure must go somewhere. So when first begin riding ISM, it is common to feel sore and tender. But that pain will go away, and you will get used it. Seriously, give ISM a chance!